Each year right around this time I get that delicious “school’s out” feeling, even though I graduated years ago! You know that feeling … that it’s time to trade in your jeans for shorts or a breezy skirt, or maybe put on a bikini and head to the pool. You wrap up work or school each day and head outside to take in the sunshine and the beautiful weather. 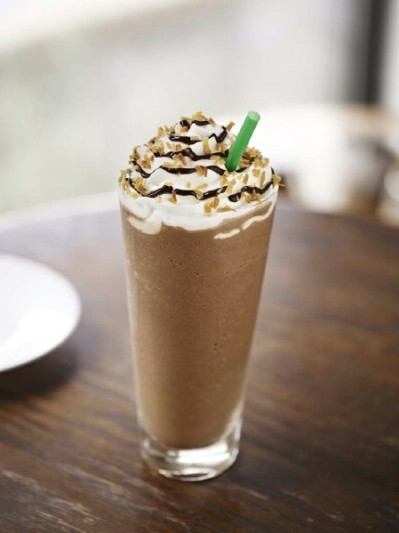 This year, your sunny season can be even more awesome with these hot summer products! These amazing summer supplies go way past sunscreen. They make it easier for you to have fun and relax, and all of them are available on Amazon.com. This set of two wine glasses is perfect for keeping wine chilled on those hot summer days! 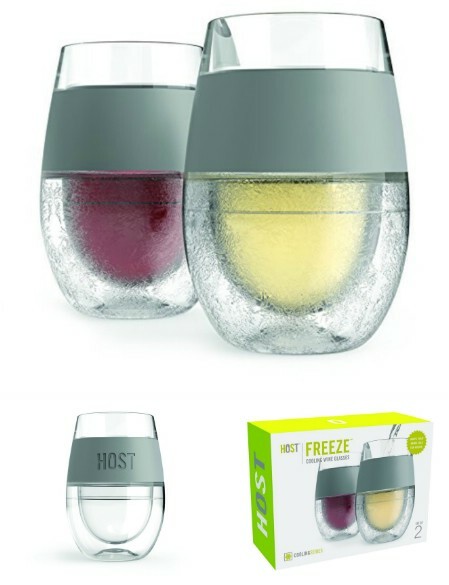 The cooling gel allows you to pour your wine without ice. That means no more watered down beverages. Customers say that these glasses not only work great, but actually making beverages cooler than ice would. These glasses can keep wine chilled for more than half an hour. They are perfect for a party or even just for a nice quiet evening by yourself or with someone special! Is one of your favorite parts of summer spending a day at the county fair? A lot of county fairs have gone way up in price around the country over recent years, but that doesn’t mean you have to miss out on your favorite summer fair treats. 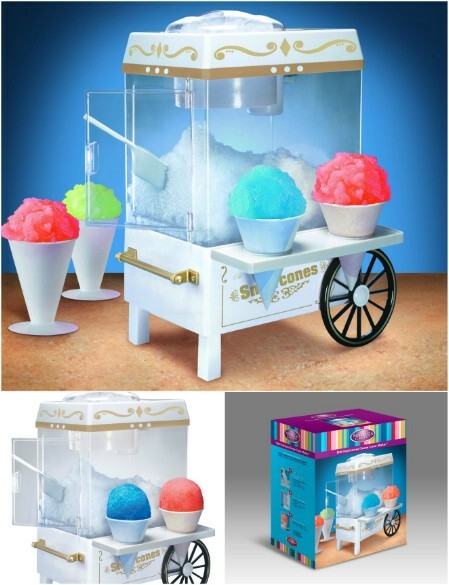 This old fashioned snow cone maker will let you make your own snow cones at home with any flavoring you choose! Not only does it work great, but just look how adorable it is! 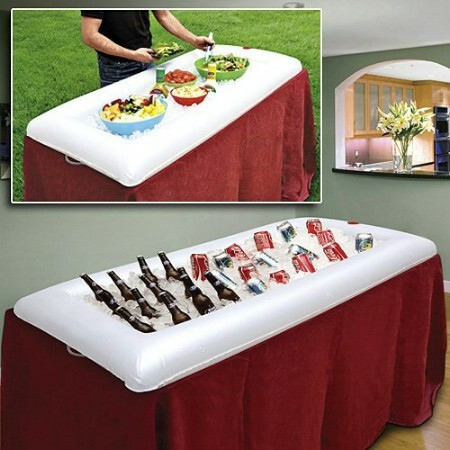 This would make for a great conversation piece, and it is another perfect summer party appliance. 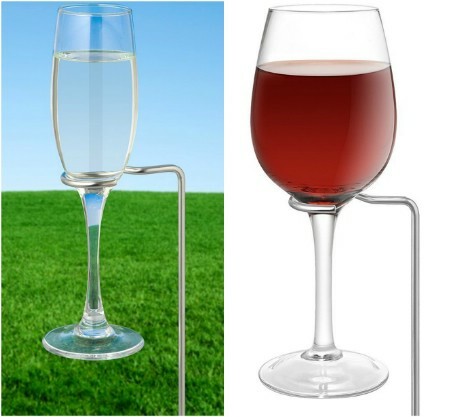 There are a lot of products out there to attach your wine glass to your chair, but many of them are flimsy and don’t really get the job done. These holders are designed differently. They each measure 12.5” and sit on the ground next to your chair. They are designed to be sturdy and sit well on a variety of different terrain types. They are great on your porch or at the beach or a campsite. Buyers give them great reviews. 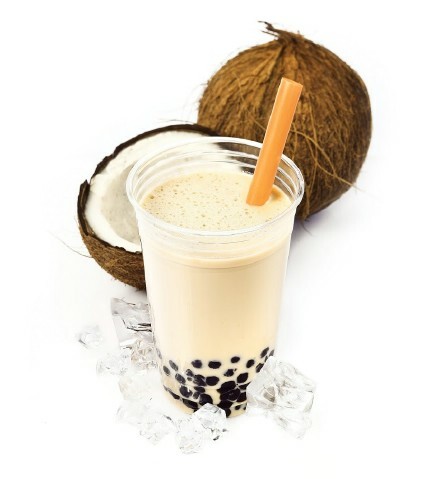 Here is another really cool drink holder for summer, also with good customer reviews. These are simple plastic containers that have a spiked base which allows you to set them in the sand. The spikes keep them from falling over. 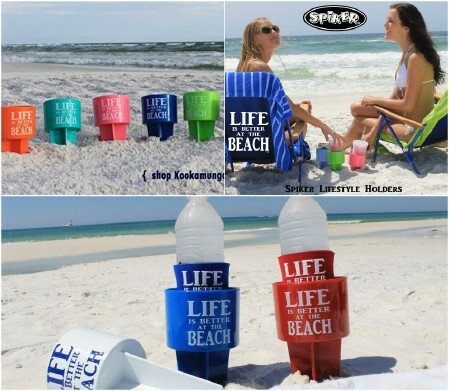 They also come with a cute slogan, “Life is better at the beach,” and you can get them in six different colors! This is the perfect lounge chair for sunbathing your back. The open/close face cavity lets you lie facedown without twisting your neck to the side. Arm cavities let you drape your arms through so you can hold a book or iPad or whatever else you want to use or look at. Since it is in the shade, you can read or use your device comfortably with easy visibility. The lounge also includes ergonomic design features which fit your body contours. You can set it in three different positions, and also fold it up. It includes a carrying strap for easy portability. Seriously, it does not get easier or more convenient than that! Want an easier, less messy way to make the s’mores that you love? 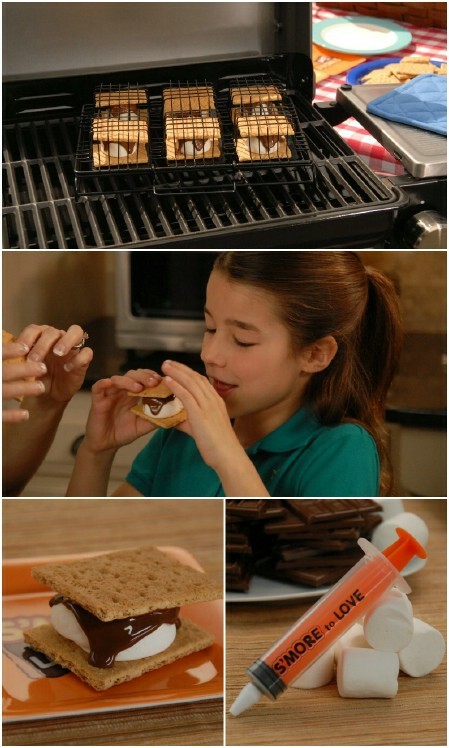 If you have a grill, this s’more maker is a great choice. Each of the baskets holds the ingredients for a single s’more. You can get them cooked to perfection in just 5 minutes. 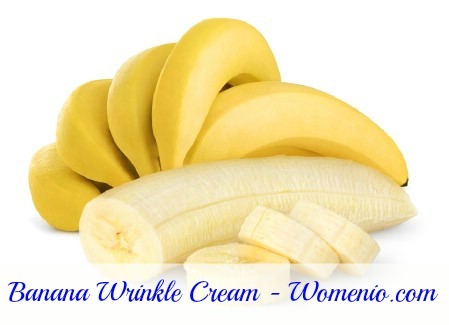 It works great indoors as well in the oven or a toaster oven. Customers say that this is a really easy appliance to use and that the s’mores come out just right! This is a must-have supply for camping or grilling out! Love your dips cool, and hate it when they warm up in the sun? 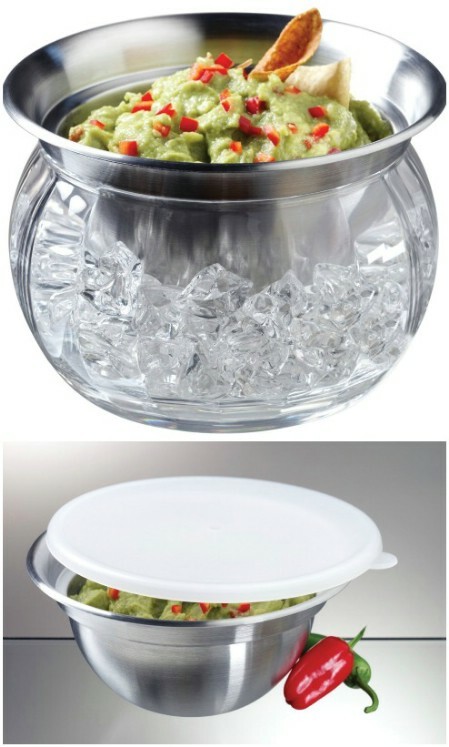 One great way to serve your favorite chilled dips at your summer parties this year is with this Prodyne ICED Dip-on-Ice stainless steel serving bowl. You just put ice in the acrylic-base, and then put your dip in the metal tray that sits on top of that. The acrylic base is designed to be break-resistant to stand up to the extremes and changes in temperature. The serving bowl can keep your dips cool for hours on end! 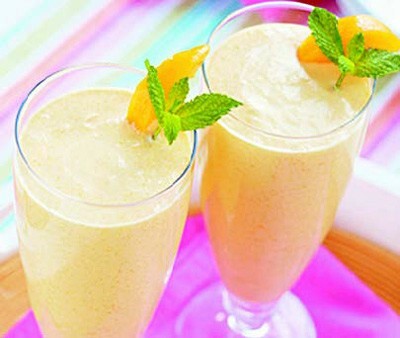 Love slushies, and wish there were a way you could make one yourself at home in just minutes? Now you can. 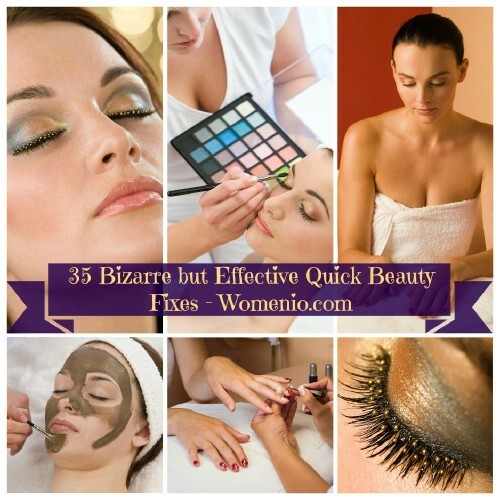 This product is really cheap and an amazingly great value. It only takes three steps, and it is easy enough that even kids can use it. 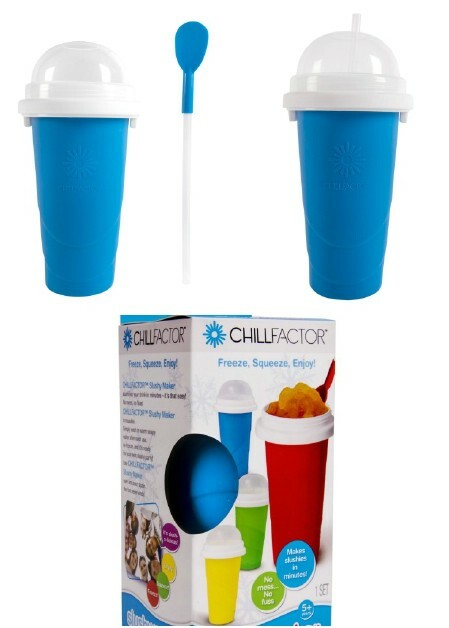 There has never been a faster or easier way to enjoy slushies! Here is a fun novelty product perfect for parties! 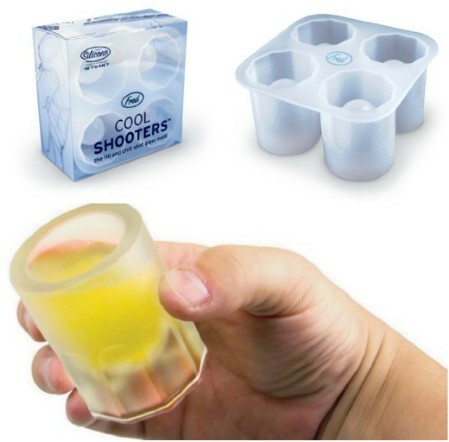 It’s a mold which allows you to make shot glasses out of ice. 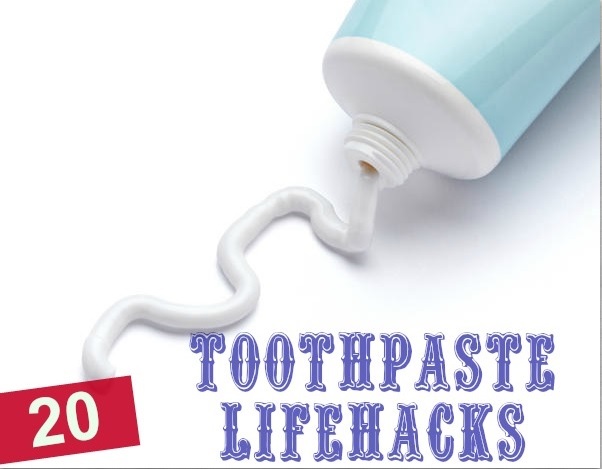 It’s easy to use; you just add water or juice to the molds and put them in the freezer. When you pop them out of the mold, you will have shot glasses ready to use! You can store them in your freezer by putting them on wax paper, so if you get started on it early, you can make more than four with a single mold. There are also fun tricks you can use to line the rim with flavor using lime juice or grenadine. Along with the traditional shot glass mold, there are a few other shapes you can try. This is the perfect product for any party, indoors or outdoors! It is designed for the ultimate lightweight portability. You can bring it with you anywhere, inflate it, and then add ice. This will keep your drinks and snacks cold. A drain plug is included on the bottom so that it doesn’t turn into a pond. This is the perfect option for bringing to a friend’s party or a neighborhood block party. It also is perfect for camping and picnics! 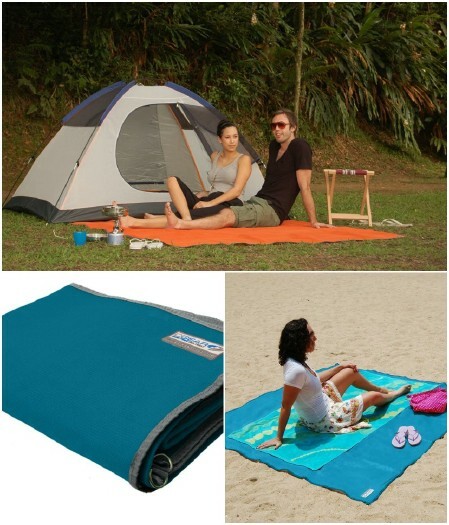 Here is another product which is popular for picnicking, barbecues and camping. 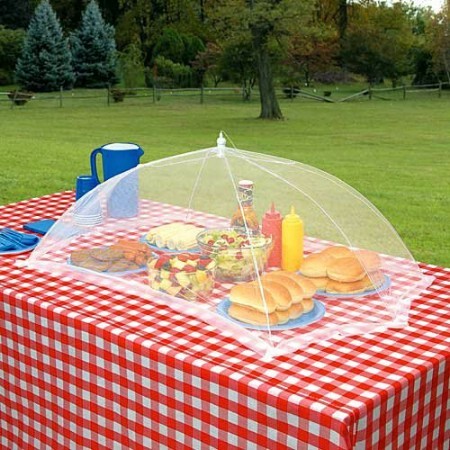 It’s exactly what it looks like—a mesh food cover to keep the bugs away from your food. This is a product you can’t head out without if you are going to be eating in the wilderness or any other area which is thick with bugs. Love making cherry pie using fresh cherries? Cherries are a summertime favorite, but pitting them can be a real pain if you are doing it by hand. This device makes it fast and easy. You can easily pit around ¾ of a pound using a plunger. You just push down on it, and the appliance does the rest. The stone is extracted and dropped straight into a helpful receptacle. There is no splattering juice and no mess. This is an incredibly popular purchase, and no wonder. 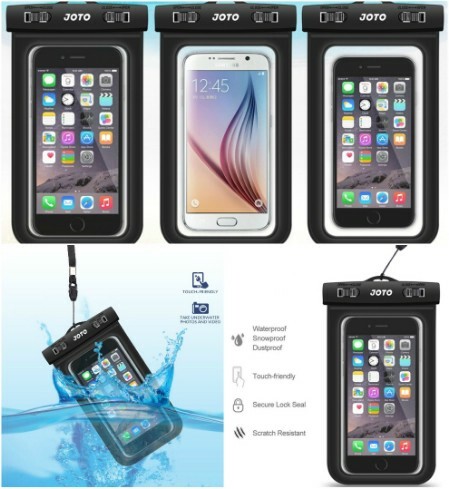 This waterproof case bag was designed to be a compatible fit for a huge range of smartphones and other mobile devices. Whether you have an iOS device, a BlackBerry, a Samsung, a Nokia, or any other device up to 6.0”, you should be able to use it! It has a clear window on both sides, which means you can continue using it to take photos and videos and more. The touchscreen continues to function through the case. 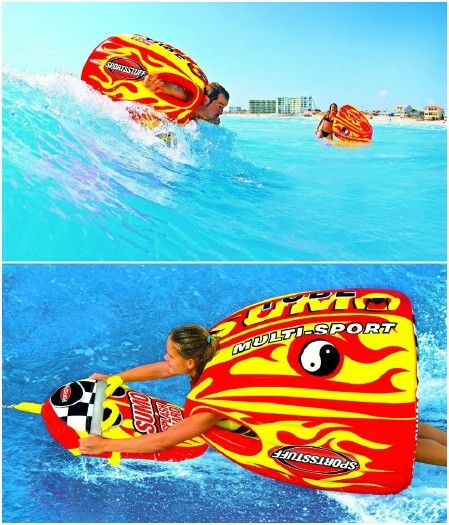 This is something you absolutely have to have if you are going to go waterskiing or surfing this year! You can capture all those amazing moments without worrying about your mobile device. 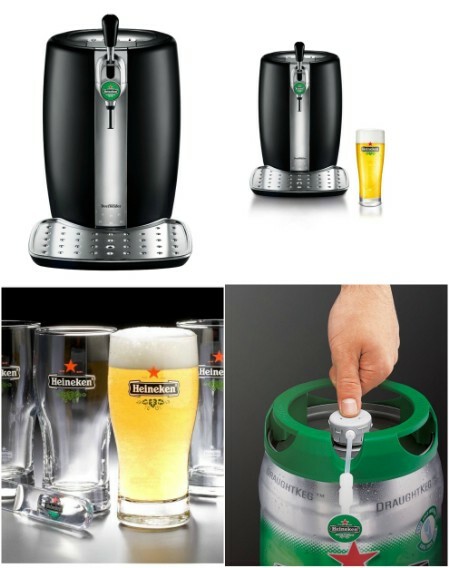 Looking for a miniature beer keg you can use to enjoy cold beer on tap wherever you are? 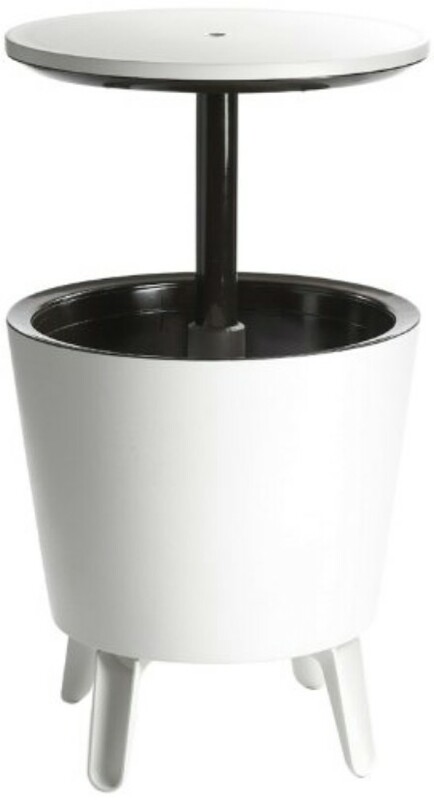 This is a popular purchase on Amazon.com, highly rated for its quiet operation and the consistent temperature it provides for your beer. In fact, it can keep beer fresh for up to 30 days after tapping. It includes great features like an LED temperature indicator and a large removable drip tray, and even comes with a pretty nice warranty (2 years). This would make a fabulous gift for any beer lover (including yourself). 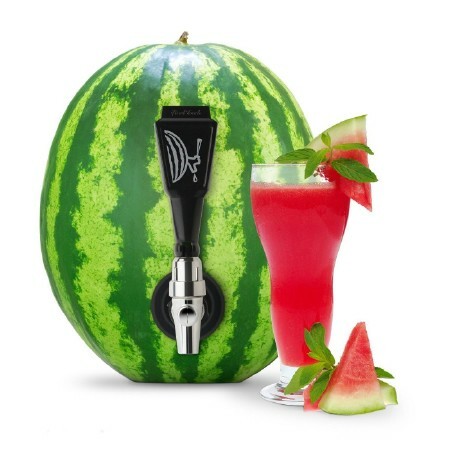 This genius device lets you turn a hollowed-out watermelon into a fully functioning keg. You can also use it with a hollowed-out pumpkin (perfect for Halloween parties come autumn). The kit will help you cut the right size hole and fit on the shank and faucet. It’s really easy and you can bet that your watermelon keg will be the center of attention and a favorite conversation starter at your next soiree. If you love late-night grilling, this is a product which will make it a whole lot easier for you. 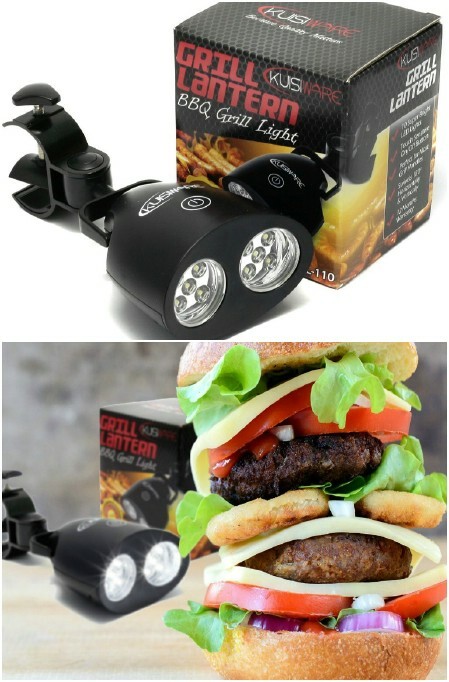 You can attach the light overhead and you will have 10 bright LEDs lighting up your cooking area. The plastic is designed to stand up to the high temperatures of grilling, so you don’t have to worry about melting or cracking. 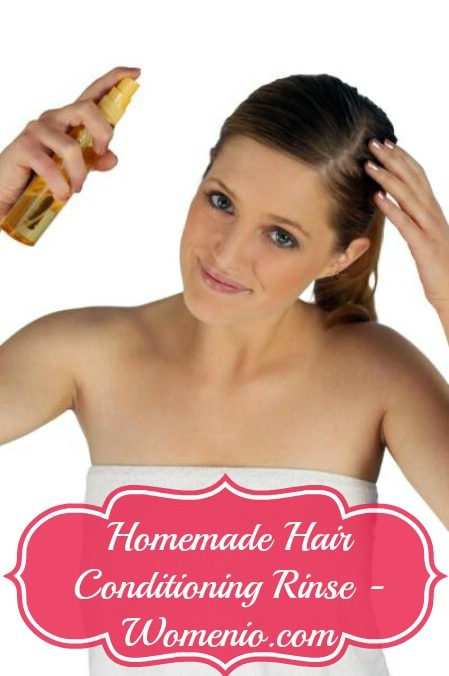 The product is incredibly popular and highly rated on Amazon, so it’s well worth the investment. Few inventions are as cheap or handy for summer as the Win2Go. 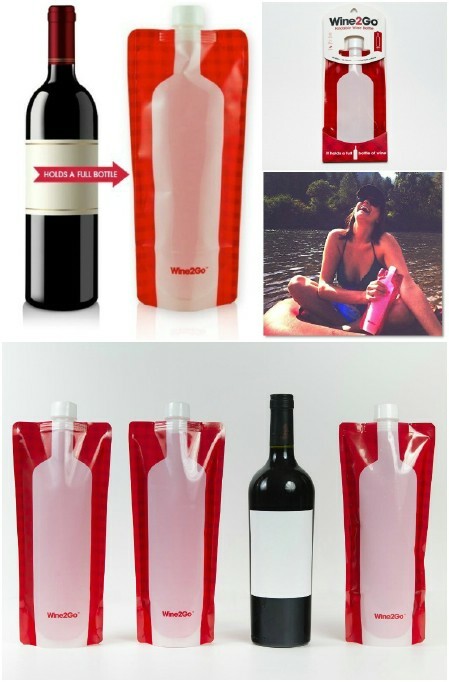 This brilliant invention is foldable and reusable, and holds a full bottle of wine. You just fill it, stow it in your cooler or wherever, and head to your party or picnic. It’s easy to use too. You just unscrew it, pour and put the cap back on. When it’s empty, you can roll it up if you want for easy transport and storage. Never worry about broken bottles again. If you are looking for an impressively comfortable and durable pool lounger which also won’t take up a lot of space, look no further than the Flip & Float. It’s made of foam and doesn’t need to be inflated. That means that you can fold it up for easy transportation in your car or storage on your pool rack. It also means you don’t have to worry about air leaks. This thing will work great for years. You can use it to sit or lie down comfortably and ergonomically. This is similar to the dip tray that we featured earlier. It’s made by the same brand and is just as highly rated. 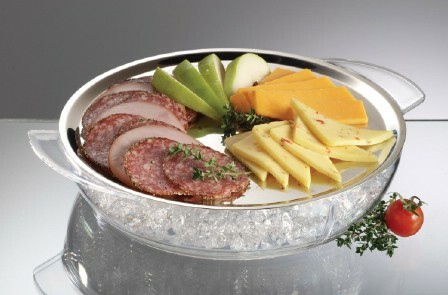 You put ice in the acrylic container on the bottom, and then you can set meat or cheese or fruit on the top part. This serving tray offers you a lot of versatility, and it’s pretty low in cost too. 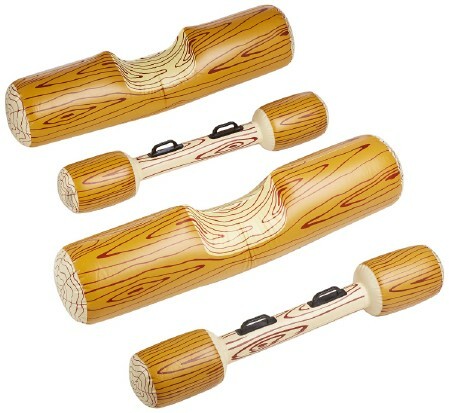 This is perhaps not the most durable product out there for summer fun, but it is certainly an entertaining one. This is a floating ping pong table which you can use in your swimming pool. The drawback with this product is that the parts are not that sturdy, and the stress on the table will cause damage over time. It doesn’t exactly replicate playing pool on land, but that’s not really the point. The unique challenges and disorder involved with playing on a liquid surface (the water splashing on the ping pong table for example) can actually add to the fun! This is definitely worth a go for the novelty value, and it’s perfect for your next summer pool party. Even though pool ping pong is a messy proposition, it turns out that a floating gameboard works out quite nicely. This gameboard by Swimline includes three different games: checkers, chess, and backgammon. It’s magnetic, which helps keep the pieces in place. Players love the versatility of the board and say that the magnetism works great. 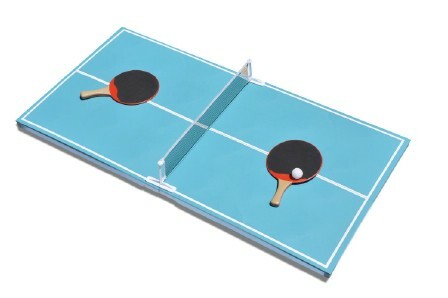 In fact, it’s so effective that you can flip the board to get the water off of it without the pieces moving even a bit. Poker and other card games are also surprisingly playable in the pool (or by the poolside). 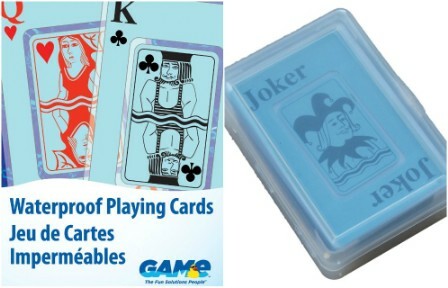 This set of waterproof cards shuffles easily and will not be damaged by moisture. That makes them ideal for any pool or spa environment. Note that the cards do not float, but you can always purchase a floating game table to go with them. 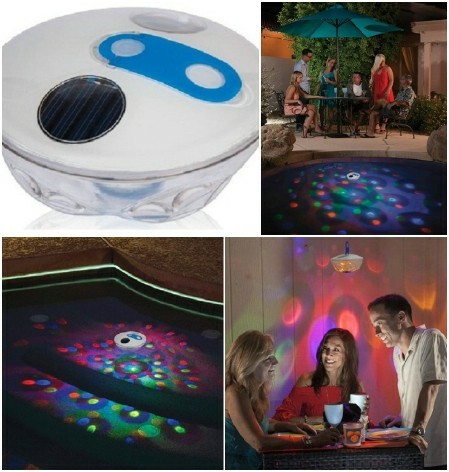 If you want to make your swimming pool look like a discotheque, this is a great way to do it. You can float this little device in your pool (or you can hang it somewhere outside of the pool). It will fill your pool with colorful lights. It’s solar powered, so you can let it soak up the sun during the day, and then surprise everyone at night when you turn it on. Depending on the size of your pool, you might need a couple of these to cover the whole area. Customers say that the light show is really incredible! If you have kids, this is a product they are guaranteed to love. You hold these just like fishing poles with your marshmallows or hot dogs held over the fire. What’s really cool is that you can flip whatever it is you are cooking just by jigging the line. 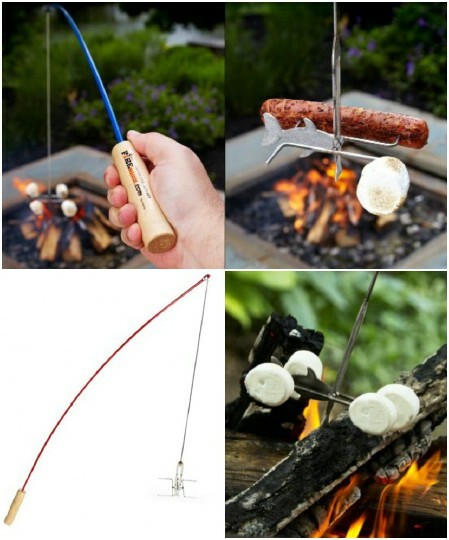 Children will get a kick out of this, and if you know someone who loves fishing as well as camping, you are not going to find them a better gift. Toss a few packs of this stuff onto a wood-burning fire, and watch as the flames magically turn different colors before your eyes. You can get a whole rainbow of hues, including red, purple, green, yellow and blue. 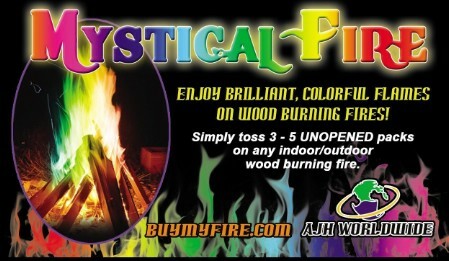 Each time, you will get about 20 minutes worth of colorful flames. This is a fun way to add ambiance to a gathering, and this is another product that children are guaranteed to adore. The whole thing about vacations is that nothing ever goes quite the way you planned it. Don’t you hate when you get all the stuff you need for cooking out and enjoy some s’mores by the campfire, only to have it rain? 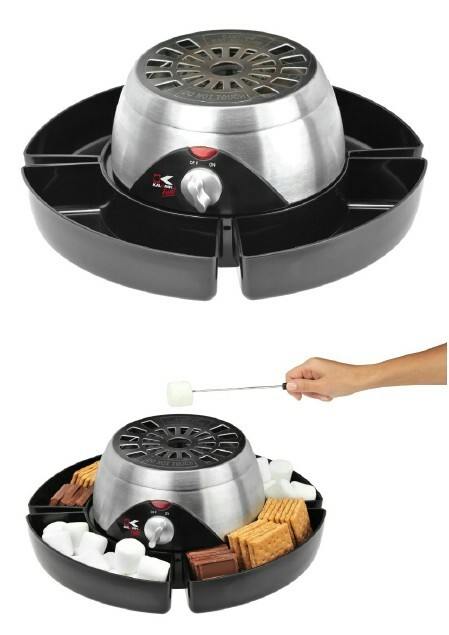 Well, the rain doesn’t need to fall on your parade if you get one of these indoor s’mores makers. No, it isn’t really the same as actually cooking out, but it’s still the next best thing. And you can be sure that the kids will feel a lot better about it if they still get to enjoy their favorite outdoor treat. 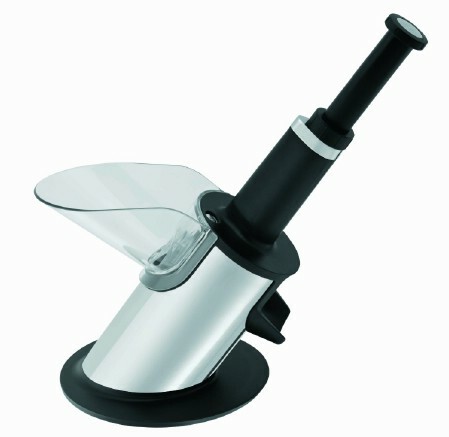 Like the cherry pitter previously featured, this makes it a lot easier to enjoy one of your favorite summer fruits. Lots of people love pineapple, but not a lot of people buy them regularly, even though they are typically some of the cheapest fruit in the grocery store produce aisle. Why? Because slicing them takes a little work. Most people don’t care to put in the effort, which is probably one of the reasons they are so inexpensive. They are delicious, however, and super good for you, and nothing shouts “summer” like the delicious tropical flavor of a pineapple. 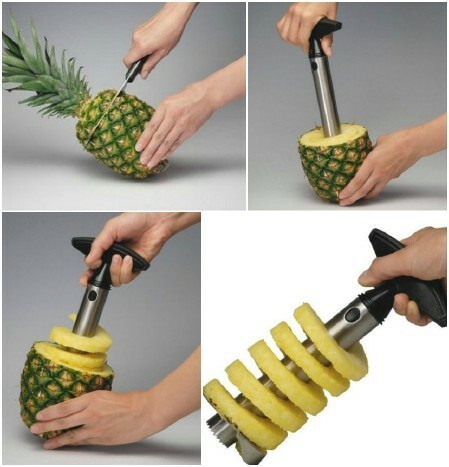 This appliance is available for just $5-$15, and makes it effortless to peel, core, and slice a whole pineapple in a matter of seconds! Now you can enjoy all the pineapple you want this summer without the hassle. These are really cool “glasses” which are bendable and will never break. They are extremely popular, and you can find them manufactured by a number of different brands. Take them with you to a party or out on a camping trip and bring them back without worrying about them. You can squash them in a backpack or purse with no consequences. 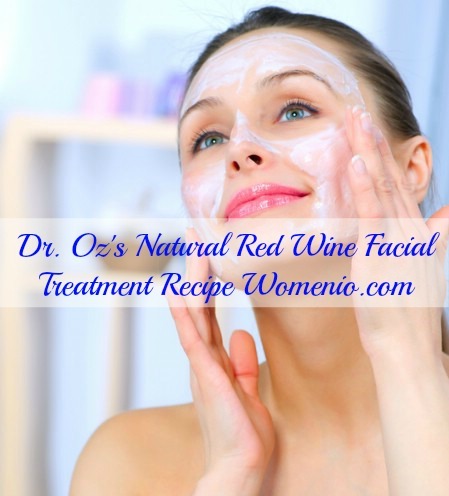 They will spring right back into shape and you can use them again and again. This is a very cute and clever way to serve watermelon! Even in that photograph, I can barely tell that it is not a real watermelon! You can use it again and again, and in low lighting, your guests will be none the wiser. 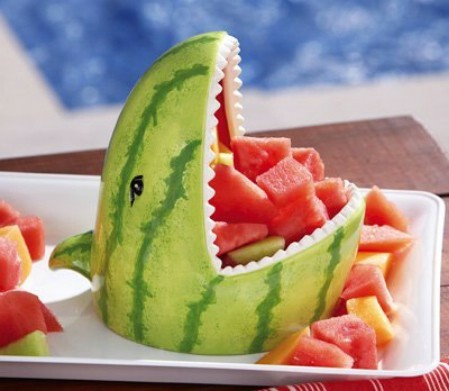 Use it to serve watermelon and you’ll convey the illusion best. But it would also be great for serving other types of melon, fruits, vegetables, or anything else. This adorable shark server will be the center of attention at any party. Once your party-goers see yours, you can be sure they will want one of their own. This is an incredibly useful item which serves triple purposes at your backyard barbecue. It functions as a cooler, a cocktail table, and a coffee table. The table part is collapsible. You simply pull it up from the cooler section and lock it in place when you want to use it. Drinks go in the cooler below, and keep cool for hours. The design conserves space and is really easy to use. What’s a party without music? 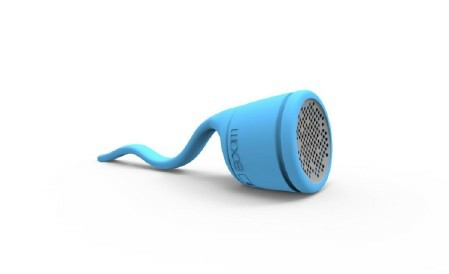 This floating wireless speaker has an IPX7 Waterproof rating and offers you up to 8 hours of full-volume performance on each rechargeable battery. You can use Bluetooth to connect it to your mobile device, which you can use to transmit any play list you like. The device includes a suction-cup mount and a detachable, flexible tail. You can twist the tail into any form you like, which allows you to attach to it virtually anything. As a bonus, it’s actually handy year-round. Some customers like to hang it in the shower. It’s easy to wrap the flexible tail around the shower spout, or you can use one of the suction cups to hook it to the wall. You want to be careful not to drop it, though it is designed to offer some durability so it can take a few knocks. Here is another cool idea for pool lighting. This is a great choice if you’re going for a more romantic ambiance than the disco lighting featured earlier. 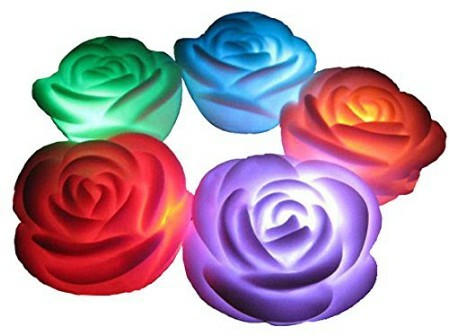 These six rose-shaped flameless rose candles will float on the surface of your pool, glowing softly in seven colors. They are waterproof and sturdy and change colors, perfect for a romantic evening in the Jacuzzi or a chilled-out after-hours party. 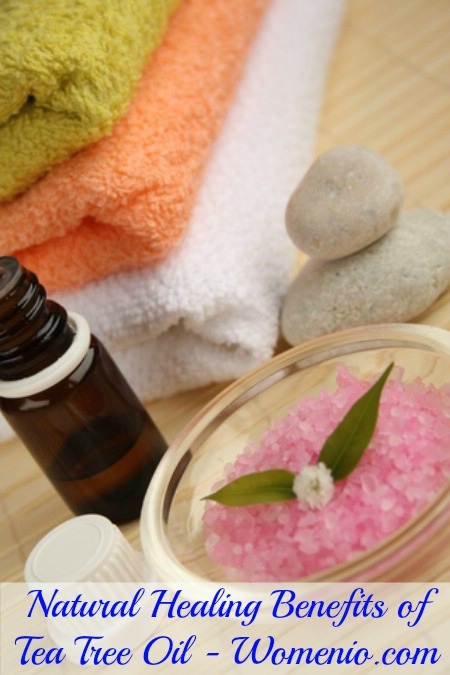 Customers love the tranquil ambiance they create, and especially their convenience and mess-free operation. Since there is no flame and no burning, there is no messy residue and no worries about the wind blowing or smoke alarms going off. If you have tried to deal with real candles in the past, you know how frustrating all those interruptions can be. This is a much easier alternative, and arguably even prettier. Looking for a fun, active pool game that kids will enjoy? This jousting set comes with two inflatable logs and two inflatable log boppers. Kids (and sometimes adults) sit on the logs and try to knock each other off into the water. Like many other pool toys, it’s not a perfect product, and it does have its flaws, but even the flaws can be a whole lot of fun. This is a great activity for anyone who loves a good dunking! Few summer experiences will thrill the typical child more than a zipline. 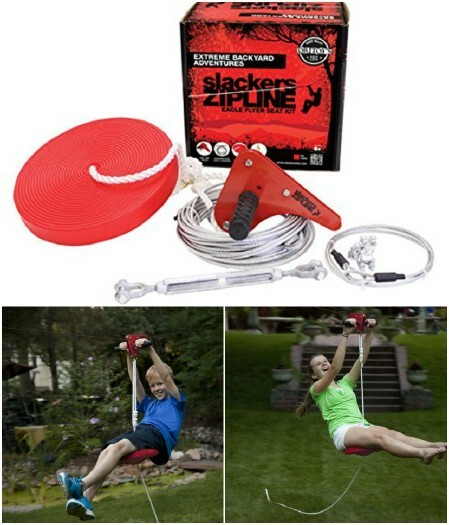 Instead of paying repeatedly to go to expensive parks or camps so your kids can play on ziplines this summer, why not buy this set for your own backyard zipline adventures? The seat is adjustable for different heights, and assembly is minimal. The price is impressively reasonable for such a cool backyard toy. According to buyers, it is easy to install, stands up great to extensive use, and is a huge hit with kids. As one customer explained, his son said it was the best birthday gift he’d ever gotten. So if you are going to buy just one amazing toy for your kid this summer, the Eagle Series Zipline is pretty much an unbeatable choice. Trampolines are a lot of fun, but they do pose some obvious safety concerns. The In-Ground Trampoline is a sunken system that you can install in the ground with the base of the trampoline buried. While this is still not a 100% safe system, it does reduce the distance a child can fall. Plus, you can install a net around the perimeter, which makes it much harder to bounce outside the trampoline’s safe confines at all (you would have to knock the whole net over to do it). 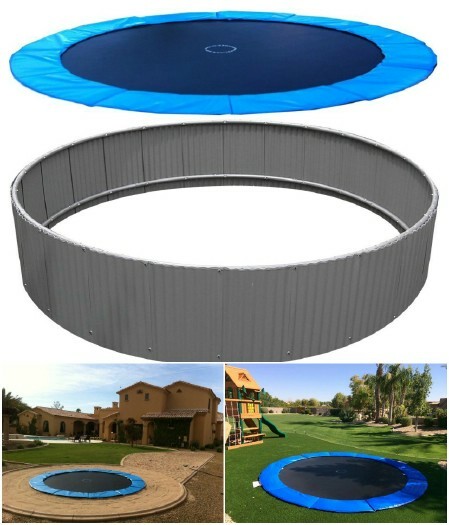 This is a really great alternative to a traditional trampoline design, and you will feel a lot better about your kids playing out there without you watching. As one customer put it, this awesome product gives you an outdoor movie experience and jealous neighbors. 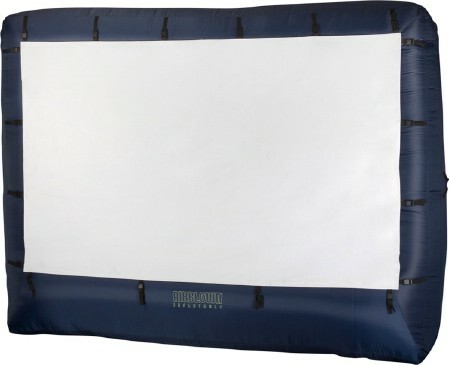 It’s a portable, inflatable movies screen you can set up on a large porch or deck or in your backyard. Twelve feet gives you a pretty big screen, perfect for outdoor parties, especially for kids. Adults love this product too, and rave about how easy it is to set up and take down, as well as reporting what a cool experience it provides for the whole family. Just be sure to anchor it well since it is lightweight and it can blow around if it gets windy. This is also a great item to pick up if you are planning a neighborhood block party, a fundraiser, or another event where you will have to entertain a lot of people. 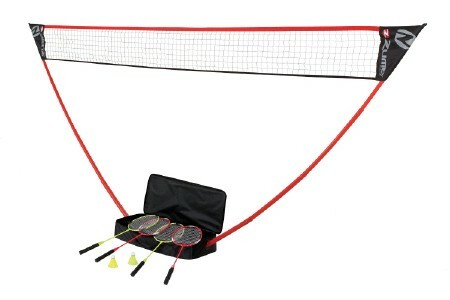 Also in the world of portable outdoor entertainment, we have this badminton set. As you can see, the carrying case is impressively small, and the entire badminton net collapses into it. The carrying case acts as a stand when you are playing. How awesome is that? 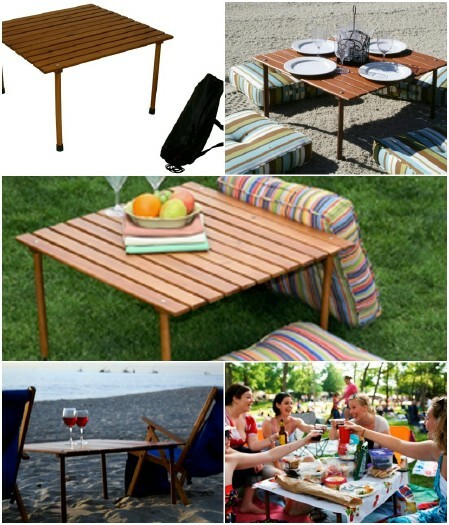 Take this with you on family picnics to the park, bring it camping, or just set it up and use it in your own backyard. 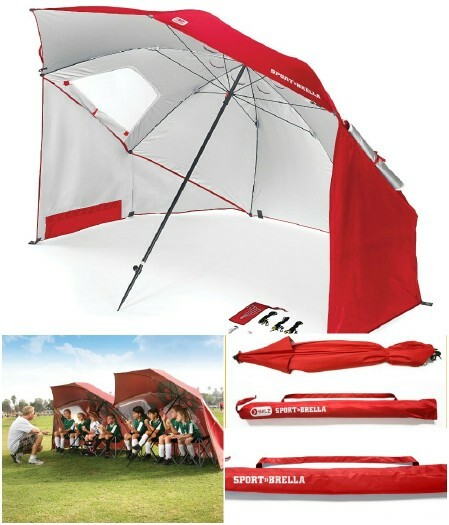 Here is something else cool and collapsible which you can bring with you on your next picnic along with that badminton set. The entire thing fits inside that convenient carrying bag, and unfolds quickly and easily for your picnic meal. It is designed not only to collapse into a small space, but also to be lightweight. That way you can carry it some distance with ease if you need to, for example to set up down the beach. The construction is water-resistant, which also makes it perfect for a seaside setting. Keep in mind it’s a small table, so you will be sitting on the ground around it. Bring some cushions along! The Quick Small Grill is another collapsible culinary item you can bring with you to your picnic. 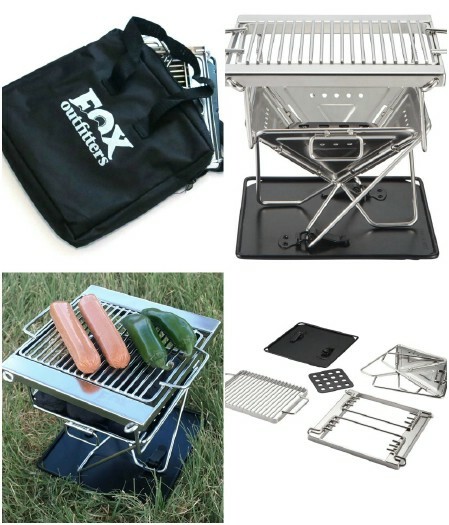 It’s a small, folding charcoal grill which you can easily set up or take down. This would make an incredible backpacking supply. Just think how easy this would make food preparation anywhere you go! There are a number of products designed with this idea in mind, so it’s well worth looking around to see what you like. The sand-free mat is made out of a patented mesh which lets sand and dust fall through to the bottom, but doesn’t let either come back up through the mesh. The result is a sand-free surface. That makes this beach mat incredibly comfortable. No more scratchy sand getting all over you while you’re out sunbathing! Even if sand gets on the mat, all you have to do is wipe your hand over it and it will fall right through. 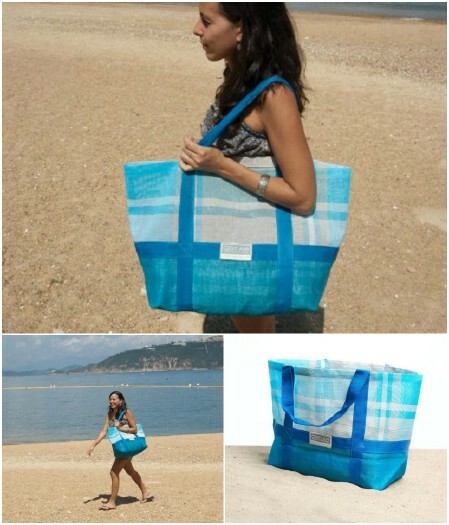 While you are at it, don’t miss out on the sand-free tote bag which is also manufactured by CGear using the same patented dual layer weave mesh. If sand gets into your bag, it will fall right out. 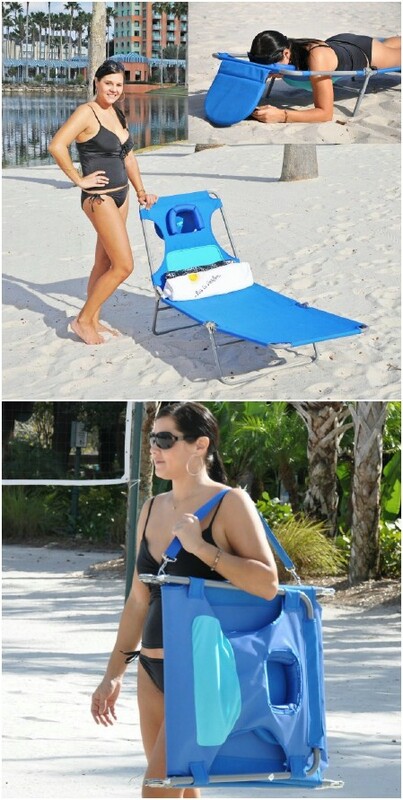 You can set the bag down in the sand next to you without worrying about sand creeping through the bottom. This is the best way to store mobile phones, sunglasses, and other sensitive items you don’t want scratched or damaged by sand. This cool umbrella comes with side flaps which offer full cover. It is large enough that a couple of adults or several children can easily sit underneath it. It’s designed to maximize airflow so that you stay comfortable and cool while keeping out of the sun. It comes with a carrying bag with a shoulder strap so you can collapse it easily and set it up wherever you want. Another perfect beach supply! 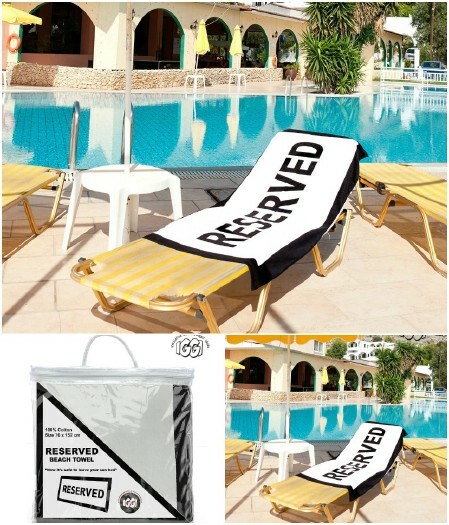 This fun towel says “RESERVED” in huge letters across it. 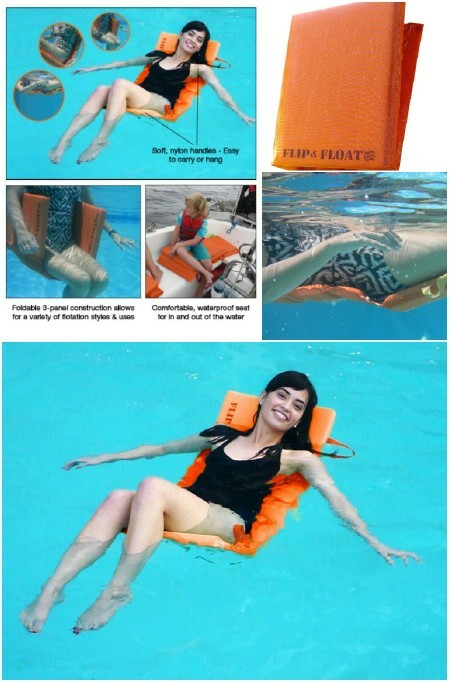 You can set it up on a pool chair or beach chair and walk away, confident that it is unlikely to be disturbed. While obviously it won’t stop everyone from moving your stuff and taking over your chair, it does a pretty good job confusing and dissuading a lot of people who would think about it. Plus, it’s a quirky product with a great sense of humor! 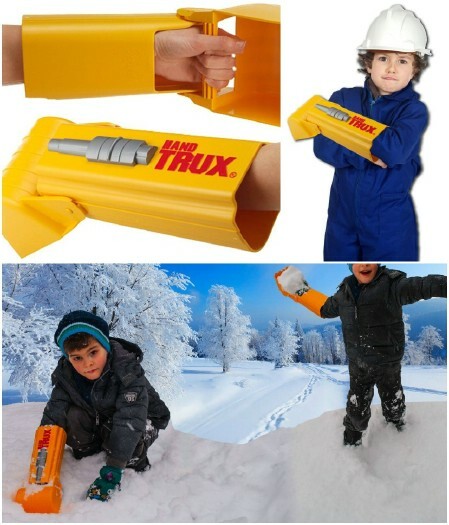 For kids that want to do some serious digging in the sand this summer, these HandTrux toys will offer heavy-duty fun. 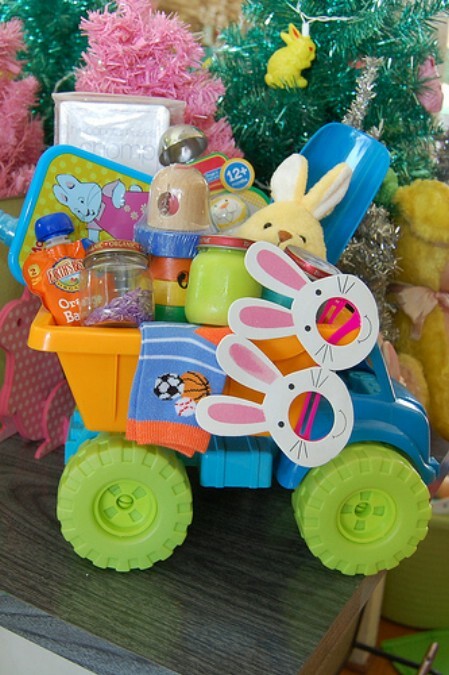 Perfect for sandcastle-building on the beach, or even just for the backyard sandbox at home. You can guarantee these will be a huge hit! I know what you’re thinking looking at the picture. Just another cooler, right? Wrong. 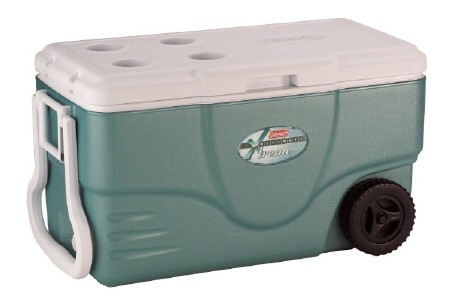 This is the most amazing, awesome cooler ever, especially at that price point. Seriously, you can buy any old cooler and pay out the nose, or you can buy this one and keep ice solid for up to six days in temperatures as high as 90 degrees Fahrenheit. You can store as many as 72 cans of ice inside. Seriously, for times when you need a serious ice cooler, this is it. This would be awesome to take along on a boating trip. Imagine days later finding that your drinks are still cold! 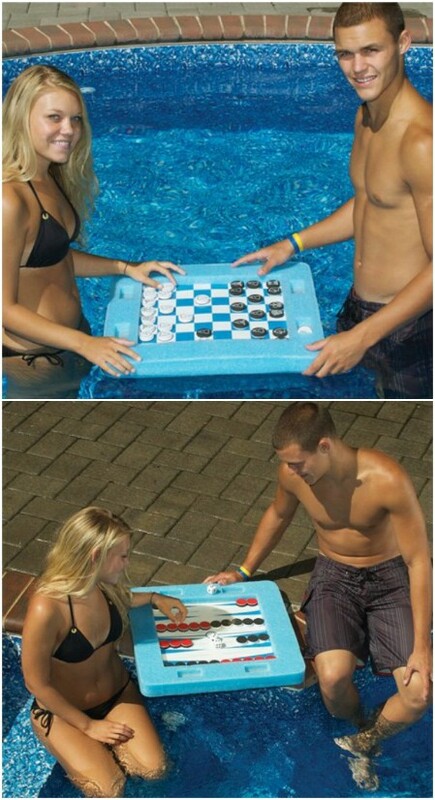 This is one of the more highly rated pool games we have found, and it is undeniably very cool. 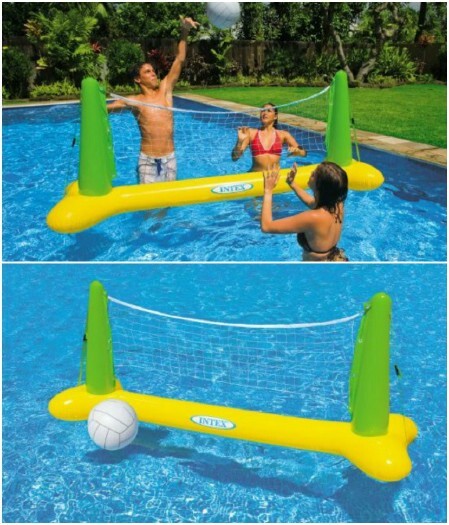 It’s easy to inflate and deflate, stores compactly, and expands into a full volleyball pool set ideal for a small game between a few people. You can attach weights to the net to keep it in place so it doesn’t float around while you are playing (unless of course you want it to). Great customer reviews make us really excited about this one. The towable Sumo Tube knocks the socks off of any boogie board. You can ride it down a wave, or you can hook it up to a boat and allow yourself to be dragged safely and comfortably along behind it. This isn’t a product for children or for anyone who isn’t a strong, experienced tuber. You’ll get a lot of water in your face, and you need to be able to get out of it quickly to stay safe. You definitely need the splash guard, and it’s best used in calm water conditions only. 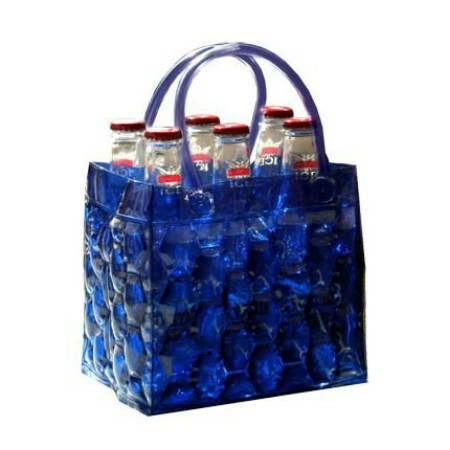 This bag by Bella Vita allows you to keep a six-pack chilled for about an hour in temperatures up to 80 degrees. It’s not the most powerful container, but sometimes an hour is all you need. It’s also got a really cool design which is just awesome to look at. Everyone will love this bag and comment on it wherever you take it. 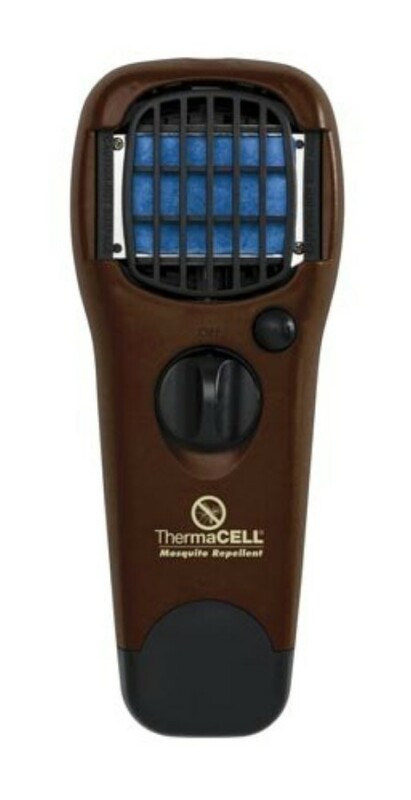 This highly rated product is small enough to fit inside your pocket, and provides you with a 15-square-foot area that should be relatively clear of mosquitoes and other annoying biting insects. The device releases a scent which mimics earth and masks your own body odor. 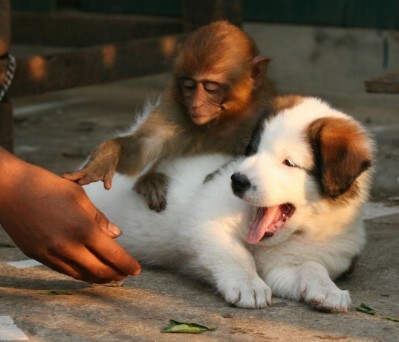 That way you will not attract the bugs. It’s powered by a butane cartridge, so you can carry it in the woods without worrying about an open flame. It’s ideal for hunting and fishing. These things are relatively common, but if you haven’t seen one before, you’re definitely missing out. 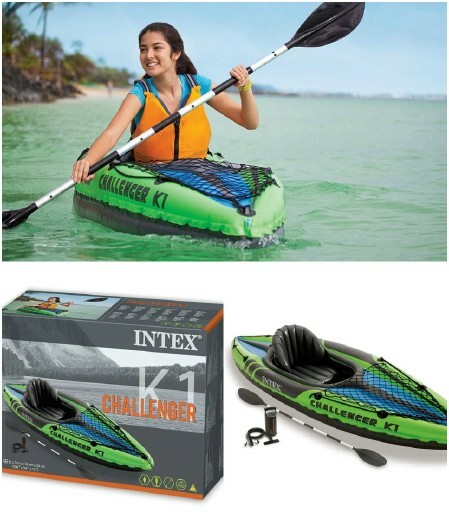 It’s a fully functional kayak which you can inflate and deflate, complete with aluminum oars! One person can sit comfortably inside, and the boat is exceptionally safe and durable. In fact, one customer even mentioned having to drag the kayak for eight hours across a rocky creek bed to escape inclement weather conditions. There wasn’t a single tear or hole. Considering you can buy this boat for $60-$150, it offers you incredible value. Why pay a rental fee when you can take this inflatable kayak out again and again? And since you can deflate it for easy storage, it is incredibly portable! Thanks for checking out our list of 50 must-have products for summer 2015! Whether you’re planning a camping trip, a beach outing, a pool party, or just looking for ways that your family can have more fun in your own backyard this year, these products will really help you make the most of it all! Be sure to share your own recommendations with us in the comments below.